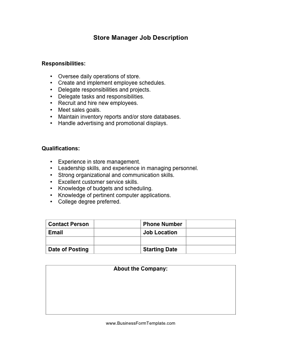 Perfect for retail positions and department stores, this store manager job description covers work duties and qualifications for education and experience. Oversee daily operations of store. Create and implement employee schedules. Maintain inventory reports and/or store databases. Handle advertising and promotional displays. Leadership skills, and experience in managing personnel. Knowledge of budgets and scheduling.